There are many variables that determine how a ride turns out. The weather is always a major factor and heavily influences many others, but is by no means the only one. My physical condition and state of mind play significant roles, as does “the rest of the day” (what has gone before and what is to follow). Thursday’s ride was a good one. The sun was out, but the wind had a chill. It was warm enough for shorts, but cold enough for arm-warmers. My ride took me off the beaten track and into the countryside proper. Having spent a day sitting behind a desk in a small office, it was great to be outside in the fresh air. Mother Nature did her bit too; the fields are full of skittish lambs and inquisitive calves. The birds were out in force at all altitudes. Small birds danced through the hedgerow as a lapwing called out overhead. A pair of pheasants proudly strutted their stuff down the centre of the road until they realised they were being watched, at which point they disappeared in a flap. This field of cows were particularly inquisitive. Have they not seen a man in Lycra before!? I turned a corner and found myself face to face with a small deer, quietly minding its own business in the centre of the road. We exchanged pleasantries before it ducked back into a copse of trees. It was all going on, and provided a perfect backdrop for my ride. As a driver, I pay little attention to the roads I travel along. Unless there is a significant issue, a deep pothole, or loose surface, it’s really of little relevance to me. As a cyclist however the roads are much more of a factor. This is understandable given I can quite literally feel the road through the seat of my pants, and because the speed of movement (or lack thereof) there is plenty time to reflect on it. When asked about most roads, I’m sure the first thing that comes to mind for most cyclists is the condition of its surface. Cycling on a smooth piece of tarmac is bliss; resistance is eliminated as every stroke of the pedal is fully rewarded. Unfortunately this is a rare exception. The roads I frequent tend to offer up more than their fair share of hazards; potholes and bumps, uneven surfaces and sunken grates. Look around at your peril! 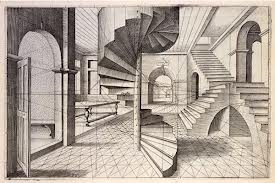 Occasionally, an optical illusion makes a climb deceptively easy, providing the sense that I’ve suddenly developed super-strength and stamina. There are a couple of routes that I regularly follow that have such hills; they never fail to delight, providing moments to savour. Of course the general surroundings, the scenery and wildlife, make a big difference too. There are some stretches that just feel good. If I’m honest, a sense of achievement also helps with the “feel good factor”, whether it’s a building sense of momentum on a gradual descent or cresting a challenging climb, the surroundings can never be considered in isolation. There are variable factors too. As my mind drifts, a thought might enter my head and occupy me for a few miles. If that’s the case, even the longest, most soul destroying stretch of road can pass in an instant. As my mind wanders, the miles roll by and time evaporates. It takes time to cycle long distances, but it often doesn’t feel like it. From time to time, a road will disappear into the distance and (at the same time) re-appear in the distance, seemingly unconnected to the stretch of road I’m on. It’s only some time later that the route becomes joined up, “whole”. Usually I only catch a fleeting glimpse as I roll along. Blink and I miss it. A prime example of the “orphaned road” anomaly. The ride has to cover both sections of road. If you don’t cycle along it, it doesn’t count. You have to be able to see the road surface. Simply seeing a vehicle on a road in the distance isn’t enough. It has to be the same road. 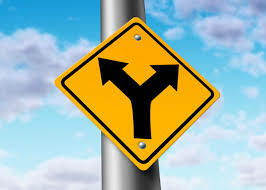 There can’t be any junctions between the sections. The further away the “orphaned” section of road is the better. Seeing these orphaned sections of road reminds me how lucky I am. I can’t imagine they exist in urban settings as buildings would get in the way. The anomaly generally requires changes in elevation and a winding road, both of which make riding more interesting anyway. I’m fortunate to have such beautiful and interesting surroundings to cycle in! I’m sure there are places in the world where the phenomenon occurs more regularly, but to my mind the infrequency makes it even more “special”. As I said, Thursday’s was a good ride! Hopefully there’ll be many more as the summer unfolds! 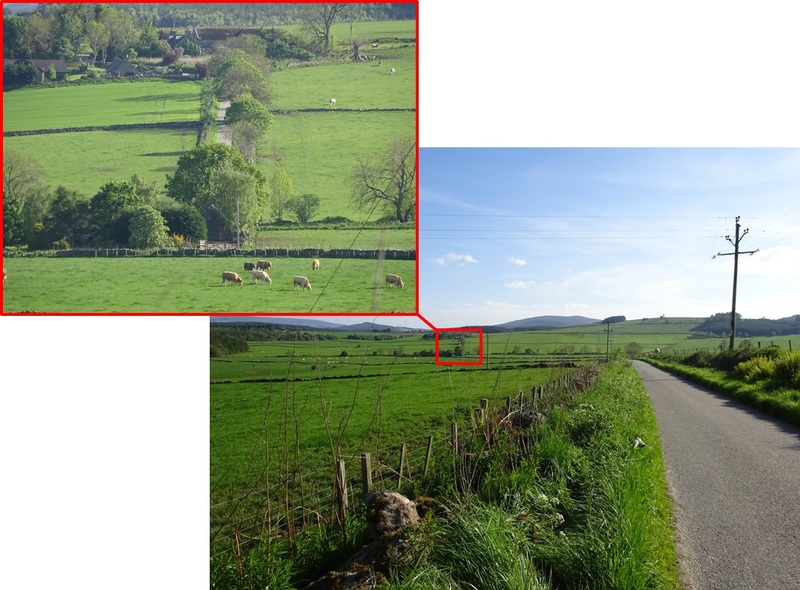 This entry was posted in Cycling and tagged Cycling, Cycling in Scotland, Orphaned Roads, Visit Scotland on May 30, 2014 by Paul Squire. Saturday’s ride was intended to be a strong. solo challenge. The plan was to combine a couple of stiff hills into a new route of just over 70 miles. I was familiar with the individual legs of the route so I was comfortable with what I was taking on. In fact, I was more than comfortable, I was looking forward to it. My pain had begun on Wednesday when I went to the gym rather than cycling to “break in up a bit”. I’m keen to get back to some balanced exercise rather than only ever going out on the bike, so I did some aero exercise on a Cross Trainer and some light weights. I never feel like I’m working particularly effectively when I’m at the gym. I either feel like I’m pushing myself too hard and unable to maintain the effort for very long (which is really not very good for me! ), or I feel like I’m too comfortable and not really getting a huge amount of benefit from it. Wednesday felt like the latter. I worked up a sweat, but that was about it. On Thursday morning, however, my calves let me know that I’d done something different. It wasn’t anything serious, they only hurt when I tried to stand or walk. Having been able to continue about my everyday business, including an hour on the Turbo Trainer on Thursday, I assumed that my legs would loosen up once I was out on the bike. Unfortunately that wasn’t the case. Despite easing myself into the ride and stretching at every opportunity my legs wouldn’t cooperate. They were tight and painful. As I approached the bottom of the biggest climb of the day I had to make a decision; My outings generally have a number of “opt out” options, points at which I can choose whether to turn for home or continue on my way. 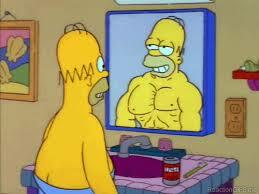 [Generally these serve as a psychological boost as I head on feeling good about myself.] The climb would have taken me out into the countryside and also committed me to a second stiff climb. So the decision was: Should I ignore my legs and plough on, or not? I decided “not”. I like to think this was a grown up decision rather than me just wimping out, but I didn’t feel very good about it. As I limped home I started to feel the cold too. It shouldn’t be like this in Mid-May… it’s time for the sun to shine and to be enjoying rolling through the countryside bare legged and in short sleeves. As it was, omitting to wear overshoes proved to be an error. Both my feet started to turn into blocks of ice. As the misery set in, my first “large-bug-in-the-mouth-at-speed” incident capped off a disappointing outing. At least I made it home in one piece. Time to put my feet up for a couple of days methinks! The perfect end to a perfect ride! 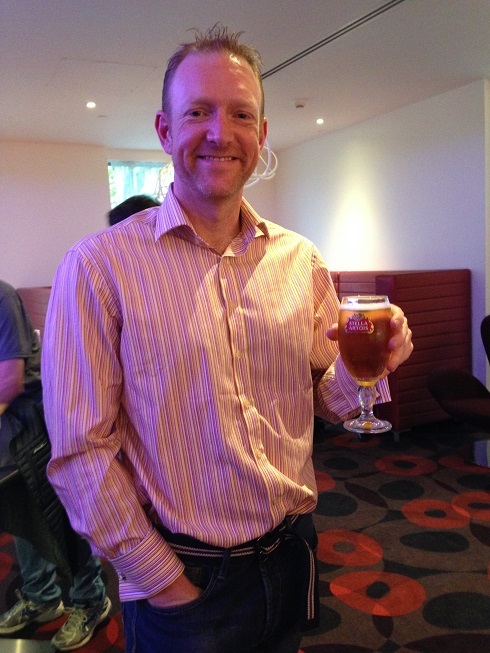 This entry was posted in Cycling and tagged Cycling, Grown up decisions, Sore Legs on May 25, 2014 by Paul Squire. This week has seen a relatively gentle re-introduction to training. Having spent four days cycling into the unknown, I’ve returned to the old familiar routes. For one reason or another however I’ve approached some of the routes from the opposite direction for the first time. Having felt like I’d exhausted my options for relatively short rides close to home, the experience has opened my eyes to a whole new range of possibilities. What I found most surprising was how different the hills feel when approaching them from the opposite direction. I know this sounds obvious, of course they’re different; the “Ups” are “Downs” and the “Downs” are “Ups”. However, even taking that into consideration, the hills were quite different to what I was expecting; a long, fast descent doesn’t necessarily mean a difficult climb from the other direction, insignificant descents can become sharp, punishing ascents and long straight slogs can turn into an easy roll. Perspective and context are everything. The scenery looks totally different too, It’s like I’m cycling along roads for the first time, they are far from familiar. I know people say that in order to get to know an area you should get out of your car and cycle or walk around it, but I would suggest that you do this from both directions to make sure you don’t miss anything. This new perspective has provided a nice distraction as I settle back into the next phase of my rehabilitation. The next month promises to be one of consolidation as I prepare for the next of my three Summer events, a gentle 54 mile roll to the South Coast as part of the British Heart Foundation’s London to Brighton Bike Ride. Keep on pedalling! 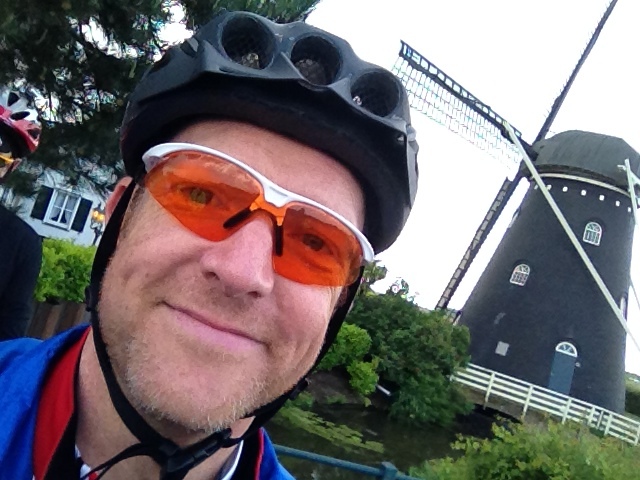 This entry was posted in Cycling and tagged Changing Courses, Cycling, Different Perspectives, Try Something New on May 18, 2014 by Paul Squire. After the excitement of last week, the past few days have been all about settling back into everyday life. Any concerns about coming back to earth with a bump have alleviated. Instead, the whole event has left me somehow feeling a bit more “normal”. It’s really good to be home! 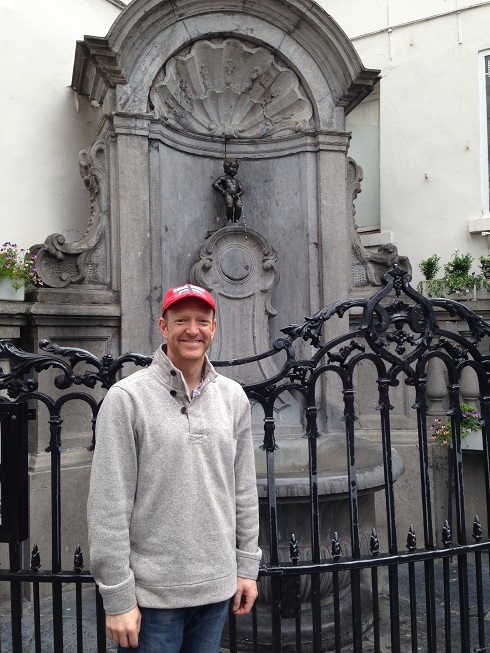 The Euro City Cycle (ECC) had become a very big deal for me. Understandable I guess given I’ve been working towards it throughout the winter. I signed up for it early in my rehabilitation, it was a real “stretch goal”. At that time, no one really knew what I would be physically capable of, now or ever, so it was a bit of a risk. Not being able to complete it (or more likely, start it) would have been a real blow, and could potentially have caused a major re-think of life post Heart Attack. From my perspective, the level of risk has reduced with every mile I’ve cycled over the past 10 months. I’ve been confident over the past couple of months, but it was great to back up that confidence with a strong ride, and a quick recovery. I was fine throughout the event and have had no ill effects subsequently. Having arrived in Brussels I had a couple of days rest. Time for my legs to recover, to warm up and dry off after the final days of the ECC. A sniffle flirted with me for a couple of days, but I managed to fight it off. Someone else’s selfie caught me taking mine! Getting back on the bike was interesting. It’s amazing how much more comfortable I am on it having been inseparable for four days. Just spending time together has made a big difference, it feels natural again, like it did when I was a kid. The key thing now is not to get complacent, particularly as I’m back on the roads rather than having the luxury of dedicated cycle routes. 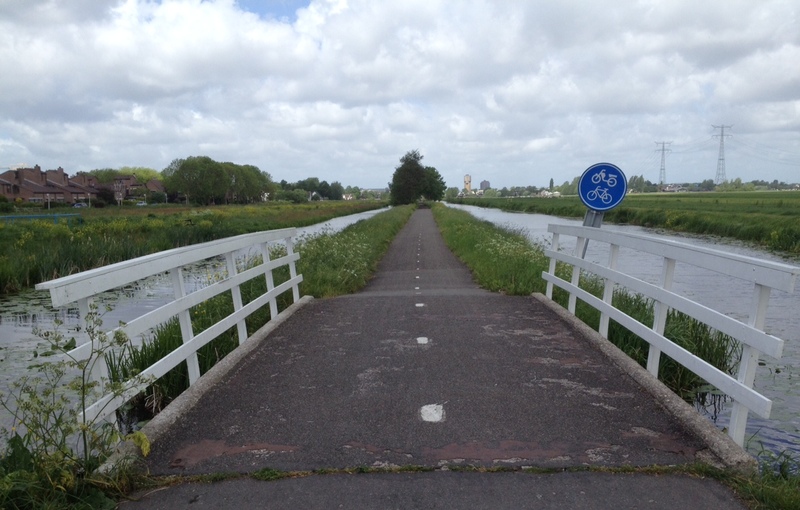 The cycling routes on the continent were something else! The biggest relief, perhaps, is that I’ve got the London to Brighton bike ride to look forward to in mid-June. This will give me a continued focus, a reason to keep going out on the bike and keep myself in shape. The ECC was a journey within a journey. Fortunately it was a successful one. It marks the end of an important phase of my life, and the beginning of a new one. No time to stand still! 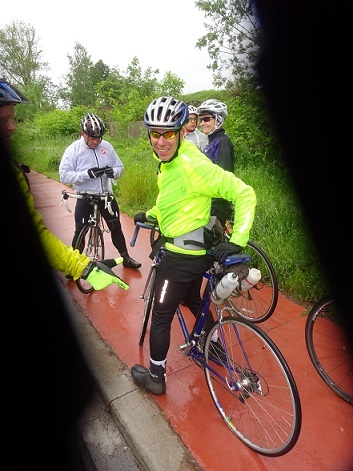 This entry was posted in Cycling and tagged Back to Normal, Cardiac Rehabilitation, Cycling, Euro City Cycle on May 15, 2014 by Paul Squire. Prince Richard: He’s here. He’ll get no satisfaction out of me. He isn’t going to see me beg. To be a cyclist means giving up an element of control. Whether it’s relying on other traffic, experiencing hazards along the way, trusting the person in front, or simply sitting stationary with a cleated shoe attached to a pedal, there is an element of risk involved. Improved bike handling skills and general awareness can reduce the risk, but it’ll never be eliminated. As with life in general, bad things happen. The most important thing is how you deal with them, and how you bounce back. Over the four days of the Euro City Cycle there have been a number of incidents. Fortunately none of them were too serious. No serious damaged was caused other than a little bit of hurt pride. With many of the incidents, the comedy factor was high: Irrespective of fault, Guides going down is always hysterical, like a Referee falling in front of a large crowd, you just have to laugh (quietly, of course!). Momentary lapses of sanity are also worth a giggle, a man hanging from a lamp-post unable to extricate himself from his pedals for example, or user-induced brake failure resulting in a tumble down an embankment. 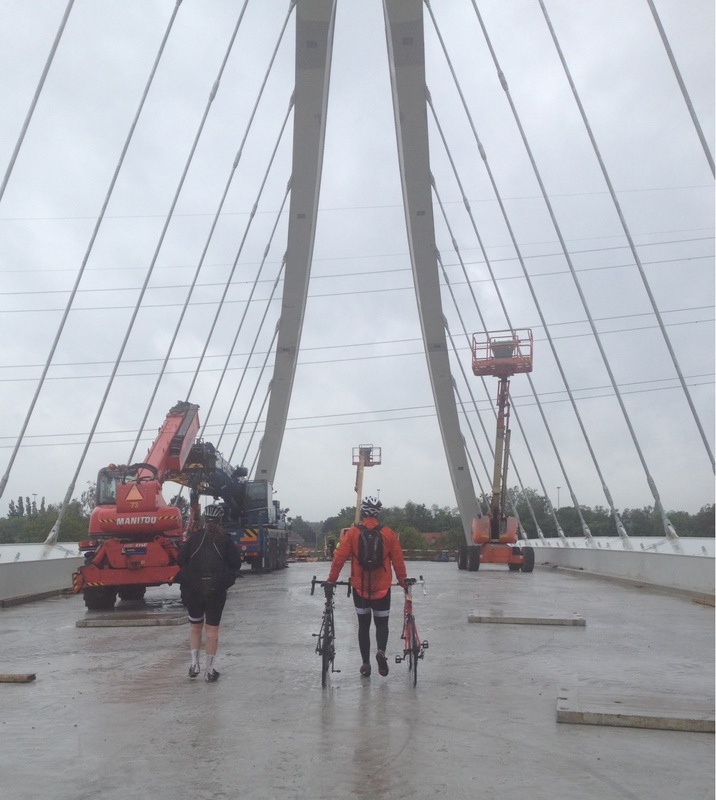 Negotiating a bridge under construction… like you do! Despite these occasional incidents, over the course of the trip people’s confidence visibly grew. With a little encouragement and practice, everyone became more comfortable, cycled a bit faster, a bit closer together, we slowly developed to become part of a team. I’m not saying we got there, but we got better. For a few seconds on the final afternoon we almost managed to draft, cycling in formation into a head wind, the lead rotated to share the effort as we pushed to maintain a steady pace. For a few seconds, we almost managed it. It felt good! Despite having to battle the elements once again, we all made it from Breda to Brussels. If I had been in Scotland I would have described the weather as dreich (“Low End” also works). The persistent rain and low temperatures made the going tough. Dampness got everywhere causing electrical equipment to fail left right and centre. However, we fought through and made it. It’s been a pleasure to share this experience with the 20 other participants. I’m sure everyone felt some emotion as they approached the finish line; a sense of accomplishment or satisfaction. It wasn’t the hardest cycling ever, but there were definitely moments when everyone will have had to dig deep, calling on hidden reserves of energy and endurance to see the journey through. 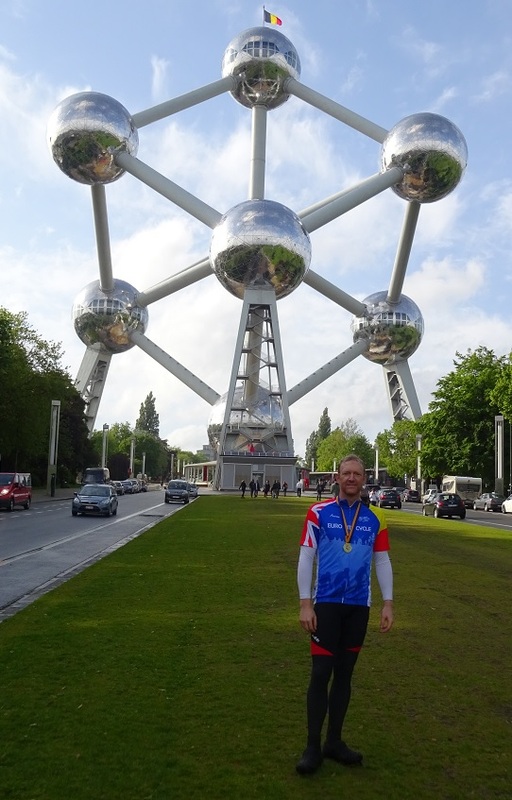 For me, the overwhelming feeling as we crested the final hill and rolled towards the Atomium in Brussels was relief. My journey didn’t start in Brentwood, it started in a hospital bed last June. I’ve cycled just under 300 miles in the past four days, but over 3,000 miles preceded them as I worked to get myself fit and strong again. There was a “Finish” sign next to the Atomium, but my journey is far from over. Along the way, we’ve managed to raise just under £3,000 for the British Heart Foundation. Thanks to everyone who has donated and for all your support over the past few days! Relief, pride and satisfaction… what’s next? 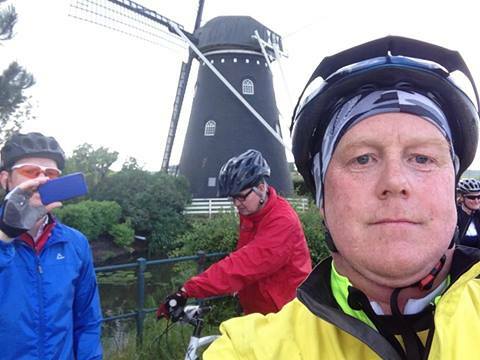 This entry was posted in Charity Bike Ride and tagged Brussels, Cycling, Cycling Incidents, Euro City Cycle, Falling off on May 11, 2014 by Paul Squire.